Gangland enforcer and trigger for one of the city's most prominent organised crime syndicates, Carver Hale is the right-hand man to feared mob boss Billy Laton; but an attack on Laton's outfit will set Hale on a blood-splattered trail of vengeance that will cross quite literally from one underworld to the next. 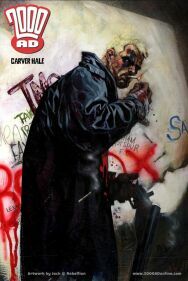 Britain's award-winning cult anthology title 2000 AD is proud to welcome supernatural anti-hero CARVER HALE to its pages. CARVER HALE: TWISTING THE KNIFE is the first series for 2000 AD from acclaimed Lucifer writer Mike Carey and artist Mike Perkins (Green Lantern vs Aliens). This contemporary horror tale marks a departure from the comic's more regular mix of futuristic action and adventure. "This story is very much in the vein of urban gangster thrillers," says editor Andy Diggle, "but with a dark supernatural slant that takes the characters in a completely unexpected direction." Premiering in 2000 AD #1236, the issue features a CARVER HALE cover by hot new talent Jock [see low-res jpeg, above], whose hugely popular work on JUDGE DREDD and LENNY ZERO has established him as a name to watch.